Trunks: Ascending to erect, branched; bark grayish brown to reddish brown, eventually peeling into persistent plates or flakes; wood reddish brown, hard. 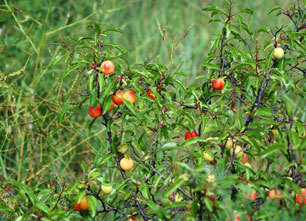 Branches usually armed, thorns reddish brown to grayish brown, .4 to 2 inches, glabrous. Twigs: Twigs reddish brown to grayish brown, rigid, glabrous; leaf scar elliptic; buds reddish brown, ovoid, .06 to .1 inch, apex acute, scales glabrous or glabrate. Leaves: Deciduous, alternate, simple; stipules linear, .08 to .1 inch, ciliate; petiole .28 to .55 inch, sometimes with glands at summit; blade lanceolate to elliptic, .8 to 2.4 inches long, .4 to .8 inch wide, base wedge-shaped to rounded, margins finely serrate, teeth with reddish glands at apex, apex acute to acuminate, lower surface glabrous or pubescent on midrib, upper surface glabrous. Flowers: Umbellate clusters, 2-4-flowered, borne at end of spur, usually appearing before leaves; pedicels .12 to .4 inch, glabrous. Flowers bisexual, radially symmetric, .35 to .5 inch diam. ; sepals 5, ovate, .04 to .06 inch, margins ciliate, abaxial surface glabrous; petals 5, white, obovate, .12 to .28 inch; stamens 20; pistil 1; style 1, .16 to .24 inch; stigma capitate. Fruit: Drupes, red or yellowish red, globose to ellipsoid, .4 to .8 inch wide, 1-seeded; stone reddish brown to tan, compressed-ovoid, .4 to .6 inch, surface rough or slightly pitted. Uses: The fruits, which appear in June and July, are often made into jelly or preserves. Comments: Sandhill plum frequently forms extensive thickets. Prunus, an ancient Latin name for plum and angustifolia, narrow and leaf.